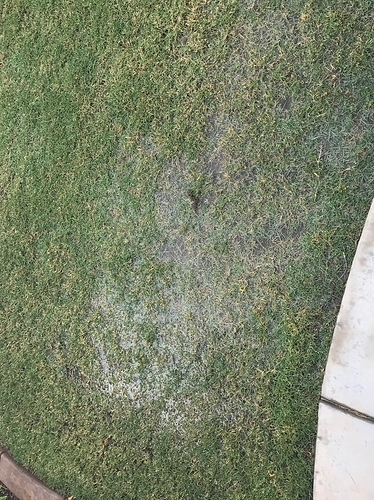 A body of water accumulates in the corner of my grass every time it waters on the flex schedule. Any help would be greatly appreciated. The picture is over an hour after the grass had been watered. Is that the lowest area of the yard with the "slight slope?" Is there a head in that corner? If there is a head, does the seal leak or leak water from under the head? Is it a fixed spray head or rotor? It also looks like an area where two borders intersect and may prevent run off. I concur that low head drainage can attribute to part of that. I also see that you have bermuda grass which thrives well in lower Ph soil. Lower Ph soil is an indicator of higher clay content. This will eventually lead to one of various types of nonbluming subterranean fungus. I would recommend changing your Rachio to the Clay setting instead of Clay/Loam. Then I recommend aerating your lawn and then applying a pelletized gypsum. the irrigation that you are applying while helping nutrients get down to the roots. In the even of having low head drainage I would recommend the aforementioned treatment as well as irrigation heads with check valves built into them. Rainbird has the SAMS heads which are good for this purpose. Toro has the Precision checkvalve insert. Hunter has the Pro Spray head.